Ok, first of all I will start off by saying that I am no expert when it comes to this band. 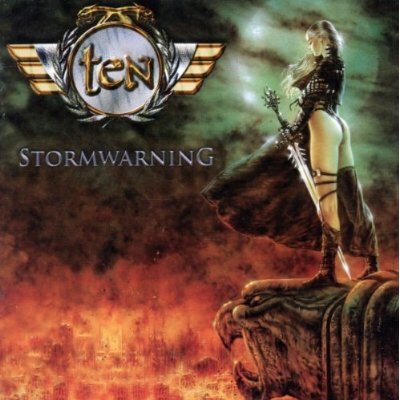 In fact, “Stormwarning” is the bands 9th studio album, and at the same time the first one first one that I have ever heard, so I have no preconceived notions coming into this review as I have nothing to compare it to and I don’t really know if that is good or bad at this point. I have decided to pick up this album because a couple years ago I discovered Dare and that is now one of my all time favorite bands and when I heard that original Dare guitarist Vinny Burns was in this band I decided to give it a go. Upon receiving this album I found out that he was indeed not in the band anymore (guess I should have done research before-hand), but anyhow It was fortitude as this is a really good album. Somewhat epic in it’s sound as I would describe the album as a symphonic rock album. Kind f like Nightwish meets Dokken if you can imagine that. The album starts off with “Endless Symphony”, a 7:26 epic and is pretty consistent all the way through. Gary Hughs vocals are excellent, kind of reminiscent of James Christian and great production by Dennis Ward who definitely put his stamp on this album. 2.) Center Of My Universe– Melodic, Symphonic, Harmonic, Rockonic!! 4.) Book Of Secrets– great hard rock, love it! 5.) Stormwarning– The title track is an awesome song!! Great keyboard intro and cranks up into some great melodic hard rock! My favorite track on the album!! 8.) The Hourglass and the Landslide– A little lighter feel than the rest of the album, similar to Invisible, great AOR tune! 9.) Destiny– Back to the epic symphonic rock! All in all my first impression of Ten was a really good one. Great songwriting by Gary Hughs and pitch perfect production courtesy of Dennis Ward! I can’t wait to go back and visit the Vinny Burns years! !